So You’d Like To Adopt A Service Dog. “How can I adopt a retired service dog? or a failed guide dog?” (we like to substitute “career change” for the word “failed”). I’m not surprised by this question. Not all puppies in training make it as working guide dogs. Not all service dogs work their entire lives. And you bet your bottom dollar that these career change dogs are well socialized, have great house manners, and are aces when it comes to basic obedience. So it goes without saying these dogs are in high demand! QUICK RECOMMENDATION: One of the first things we did before bringing home our first puppy was ordered and read through Puppies for Dummies. It’s an excellent book that teaches the basics of raising and training a puppy. If you’re considering adopting a puppy then be proactive and start reading about what you can expect. I’ll go over a few facts about career change or retired service dog. A few tips I’ve learned over the years as a puppy raiser on how to give yourself the best chance to get a retired service dog. Finally, I prepared a list of assistance dog organizations with adoption programs (with direct links to adoption pages). I have an aunt that adopted a service dog that didn’t make it through the training. Something to keep in mind for readers. It’s a tough process to find the right dogs for these programs and sometimes they just aren’t able to make it. But these little guys who sadly, fail out of the program, are super smart and need a home. So if you don’t need a service dog but are looking for great little pups who need homes, you can also reach out to these groups to find out where they send the pups that don’t make the cut. If you’re thinking about adopting a Yorkshire Terrier, a Bulldog, or an Irish Wolfhound then it’s highly unlikely you will find what you are looking for when trying to adopt from a service dog organization. QUICK TIP: As I mentioned the two most common dog breeds in service dog organizations are Golden Retrievers and Labrador Retrievers. Read up on these two breeds to make sure their personality, temperament, and energy level will fit your lifestyle. While I’m not ruling out that you will never be able to adopt one of these or many other dog breeds at a service dog organization I will say it’s highly unlikely. Labrador Retrievers and Golden Retrievers are the most common breeds available. You will also see Lab/Golden crosses as well as German Shepherds, Poodles Labradoodles, and Goldendoodles. We have seen many other breeds working as service dogs, but these are probably the most common you will see in one of these adoption programs. Many of these organizations have a very long waiting list for adoptable career change service dogs. For instance, Guide Dogs of America: “Currently the waiting list to adopt a dog is over six years.” Can you recall what you were doing six years ago? Can you imagine what you’ll be doing in six years? Most programs have more inquires then adoptable dogs and therefore their selection process is based on suitability rather than a first-come, first-serve basis. So even with these long waiting lists you may still receive a dog earlier then anticipated. Health – anything from allergies to cataracts to varying severities of dysplasia (hip and elbow). Behavioral – high activity level, incompatibility with cats or other dogs, assertiveness requiring strong handler leadership. Some of these dogs may not be suitable for homes with young children or other pets. I wanted to know how to adopt a seeing eye dog that has been rejected. Okay guys and gals. Do you still want to adopt a retired service dog? Do you want to know the best way to facilitate getting said retired service dog? After 10+ years of raising guide and service dogs I’ve learned a thing or two about how to give yourself the best chance to adopt a retired service dog. Get involved with the organization – As a puppy raiser I have the first opportunity to adopt a career change puppy that I raised. Stetson was the first puppy I raised and now lives at home with me as a pet. A friend allowed guide dogs to use his facility for monthly meetings. Several years later he was interested in adopting a career change guide dog. The adoption department bumped his name up the waiting list. Find a local service dog organization – After reading through hundreds of assistance dog websites I’ve found that the majority only adopt out locally. Check out our Ultimate List of Service Dog Schools with Adoption Programs to find a local school near you. Make a donation – We know a local business that makes yearly donations to guide dogs to sponsor puppies in the guide dog program. Needless to say the organization owners has priority anytime they are interested in adopting a career change puppy. Be flexible – I’ve heard through the grape vine that if you are willing to accept a dog with health problems you will have a chance to adopt a retired service dog much quicker. The severity of health issues can vary from simple skin allergies to severe hip or elbow dysplasia. Of course being flexible is not just about accepting a dog with health issues. Expanding your criteria to any breed, color, age, etc. will give you more opportunity to adopt a dog. Keep in touch – Another tip I heard through the grape vine is don’t just send your application in and wait six years. Follow up regularly, get to know the adoption coordinator, visit the campus, talk to employees at the school, and puppy raisers. Keep in touch and stay connected. By keeping in touch you’ll find out when puppies are dropped, when dogs are retired, and when a dog becomes available. The ultimate list has not yet arrived. Sorry folks I did not have it prepped in time to publish with this article. I’m in the process of sifting through hundreds of service dog organization websites to find the exact adoption page on each site. In a few days I’ll have that page live so make sure and subscribe to our newsletter, add us to your RSS feed, or check back with us in the next few days. UPDATE: Here’s the link to our list of assistance dog schools with adoption programs. By the way, if you know of an assistance dog school that has an adoption program please let us know so we can update our ultimate list. Do you have any questions on how to adopt a retired service dog? Have you already adopted a career change guide dog? UPDATE: Can you believe we wrote the original article on how to adopt a service dog way back in 2007 (Stetson wasn’t even 1 year old and still a guide dog puppy in training). Persistence – you need to keep looking and trying. Patience – most likely it won’t be a quick process. Service dogs are well bred, socialized, and trained. However, you’ll still want to keep up with their training. If this is your first dog or if you need to brush up on your knowledge and skills I highly recommend reading an introductory book on dog training. One of our favorites is Puppies for Dummies (I know I already mentioned this book, but it’s worth repeating), a quick and easy read that will give you a solid foundation for your new dog. Best of luck finding your career changed service dog! Let us know if you have any questions. This was a VERY informative and helpful article and guide. We have been talking about adding a career change dog to our family for companionship, protection, comfort for our aging selves as well as helping another of gods creatures. A big thank you for this info. Will be checking out the ultimate list you provided! Looking for a dog. Please let us know if and when you have any available. Interested in learning the process it takes to acquire a dog being returned for other reasons to the public. Thank You in advance for your help. 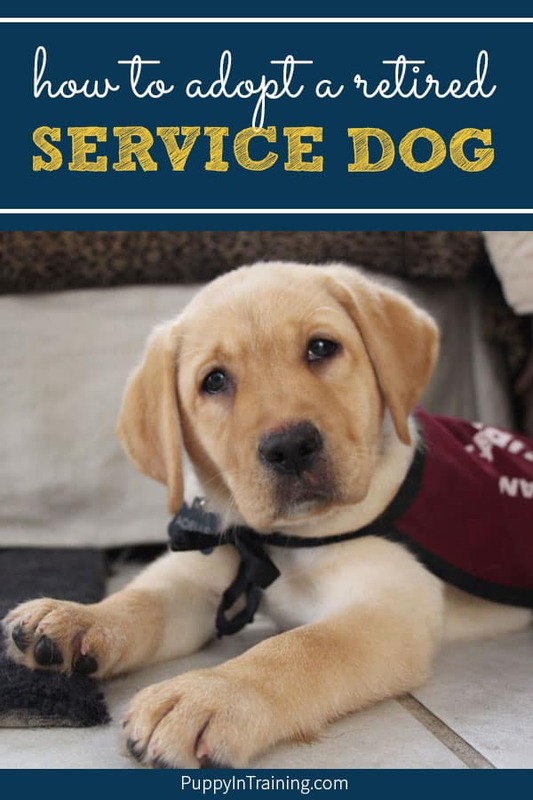 Check out this list of service dog organizations with adoption programs: https://puppyintraining.com/the-ultimate-list-service-dog-schools-with-adoption-programs/ Good luck with your search. I have just finished reading “A Dog Called Hope” I have 2 dogs at this time but they are both 13 years old. I know they will not be with me much longer. I would like to be on a list to adopt a service dog that did not pass the final training test. I am also very interested in the organization. I am a school nurse and I will be retiring in a few years and am looking for something worthwhile to do with my time. Hi there, Please let me know if you have a Labrador or Labrador Retriever who has not quite made it as a Guide Dog as I would dearly love to adopt it. I have had Labradors (and Retrievers) since I was 10 – am not 57 and am evidently still in love with these beautiful dogs. I lost my 12 year old boy just recently to cancer and have another boy who would be so happy again to share his life with another Lab (boy or girl doesn’t matter, as Ziggy is desexed). So please do not hesitate to contact me if I can be of help – as you are helping me and Ziggy too !! Hopefully that helps. Good luck with your search. If you haven’t already take a look at our list of service dog schools with adoption programs: https://puppyintraining.com/the-ultimate-list-service-dog-schools-with-adoption-programs/. The best thing to do would be to look up nearby schools and inquire about any adoptable dogs they may have. We only train 1-3 dogs a year so the number of adoptable dogs we have available is extremely limited. Good luck with your search!